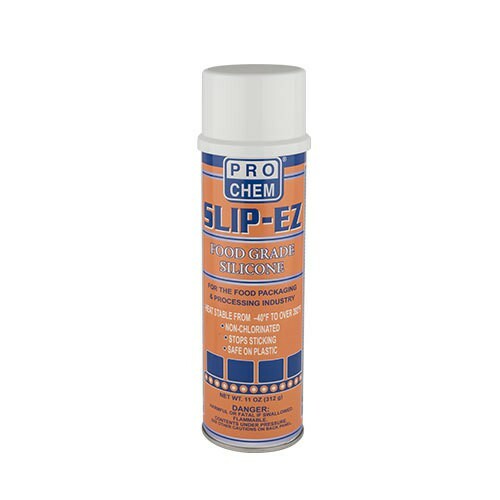 Slip-Ez | Pro Chem, Inc.
SLIP-EZ is a silicone aerosol that lubricates, protects, reduces friction and makes everything slide and glide easier. It forms a slick, water-repellent, non-adherent surface coating. SLIP-EZ deposits a stick-free surface wherever needed. It saves time, money, cleanup and aids in the prevention of corrosion. When using this product, there is less jamming. It will not discolor or damage fabrics, metals, rubber or plastic surfaces. Can be used to lubricate moving parts in food processing and packaging plants. Can be used on non-food contact surfaces of ovens and grills to prolong time between cleaning. Dry silicone formula prevents jamming and production slowdown on bottling and packaging lines. Thoroughly clean surfaces to be treated. Use steel wool on metals and wipe with a good, compliant cleaning solvent if necessary. Clean rubber and plastic surfaces with detergent solution, rinse and dry thoroughly. Spray a thin, light silicone film; avoid over spraying. Remove excess with a clean cloth. Renew when necessary. ATTENTION: Do not allow spray, mist or coating to cover floors; they may become slippery, especially when wet.